Once again I have opened up the archival Vault of Uselessness in this blog to give another look at some of the things I like most. As is the case in any blog, the selfish interest of the author is thematic – and, in this case, plain fun. I watched this movie again the other night just for giggles and it amazed me for a second time. 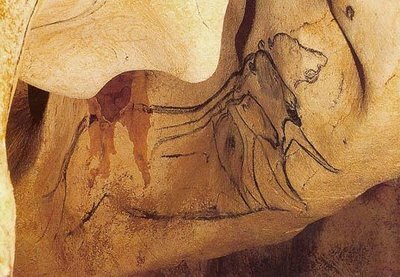 The carcasses of ancient animals which had become glazed with stalagmite juice, basically “Quartzified” into stone, reminded again me of the sheer scope of this discovery. 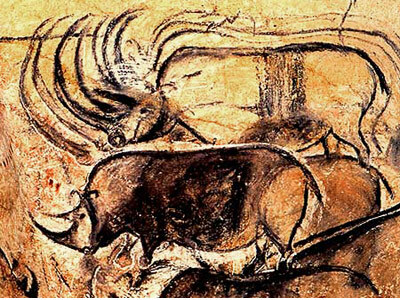 Human art dating from over 20,000 – 30,000 years ago and just as subtle and beautiful as if it been accomplished by talented modern hands, displayed gallery-like on the walls of ancient caves, is only one of the fascinating wonders which Werner Herzog takes us through. His mix of music throughout the film is another glory of novelty. The best browsing of this post would be to begin the music video below and then read the text. Try that. Reading Henry Miller some years ago, I never forgot his delighted discovery and his fascination with the term “Chthonic” – as if it had appeared to him as a magical key to describing ineffable events. This film and even its sounds are completely “Chthonic” and of a piece. It reminds me of nothing – they both stand on their own. To the archives, then………. (pictures enlarge by clicking). OK, this is a stretch for a simple landscaping blog. Just know this: I know that and let me say my piece. 😉 It’s never stopped me before, has it? This one deals with the Earth, having said that, and that’s my own area. Dirt rocks and so do rocks. I recently went to the movies, chucked on my 3D glasses and watched one of the most stunning movie events I have ever seen. The film is called “The Cave Of Forgotten Dreams” and I cannot possibly recommend it high enough. 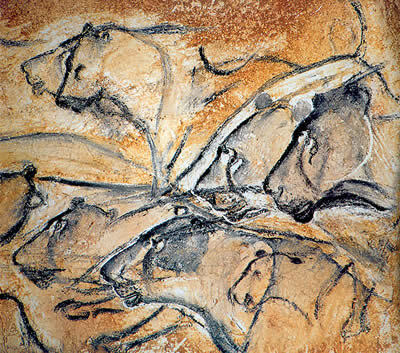 It was directed by Werner Herzog and deals with an inside look at the astonishing Cave of Chauvet-Pont-d’Arc, where artists as long ago as 32,000 years plied their art of cave-paintings, using the walls of this gorgeous, previously-hidden cave as their canvas and using the folds and 3 dimensional aspect of the terrain itself to provide depth, apparent motion and breathtaking artistic ability. The extremely cautious French Government goes overboard in scrupulous preservation paranoia, and the film mentions this. Protecting the inside treasure is testified to when references to them shutting the cave off to visitors for a few months was felt necessary owing to “The breath of visitors is causing a mold to adhere to the walls.” This is a look inside – a rare moment in time and one which may or may not ever be replicated. The cave simply reveals life at that time in a manner which nothing else possibly could. The genius is inside the art itself, of course, but the creative genius of Werner Herzog amplifies it, juxtaposing all this with modern perceptions of an era, seen from the best anthropological, psychological and paleantological minds of our generation. The movie possesses so much depth and range of emotion and the hidden tension of discovery, that it nearly stands alone as an experience of brotherliness linking ourselves with our incredibly ancient past. I have to suspect this is an instant classic, no matter how uneven it might seem at its start. The punch is delivered as we advance, revealing all the incredible wonders this cave has to offer. Bear skulls, complete vertebrae of gigantic land animals, pictures of the rhinos, the Ibex, horses, lions, bison adorn these walls in graduated impact as the camera gets released later to fully explore. It all makes sense and comes together incredibly effectively as we witness what a treasure this is. The drama of this discovery is served well by Herzog and the ineffable music streaming from the cello of the master cellist, Ernst Reijseger, which takes on an increasing urgency and even pathos as we discover this enormously ancient past of all of ours. The musical work of Reijseger is of a quality I have rarely seen before – it is clearly evocative and it seems utterly spontaneous as it impacts us concurrently with the images we behold and the verbalized statements from the long list of exceptional people. It courses through the film in a sensuous, even mysteriously sinewy way – somehow absolutely perfectly emotive and even responsible as we peer into who we once were. It is somehow totally fitting that we should answer the very height of their art with some of our own. 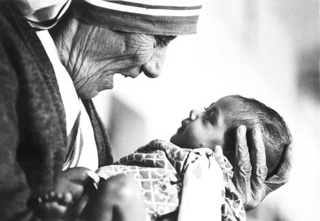 There is humanity here and a respect for our past. I mean a deep respect for our past. Oddities galore – it appears Neanderthal man was around as well as our own Homo Sapiens species evolved in the same neighborhood. Entire skeletons of the animals of the day appear, close up and personal. This is totally cheating but I really don’t care. I make no apologies for loving – adoring – great music. Youtube makes it ridiculously easy on bloggers to simply take art from somewhere else and toss it up, acting like their taste matters. Well, I happen to think it actually does matter. “I wonder if folks have ever seen these, because, if they haven’t, I’d bet they’d be grateful after experiencing them.” This is as complicated as it gets. It’s most certainly some very simple sharing with people I like. In the first video are old favorites of an entire generation: Robert Plant and Jimmy Page, working with an Egyptian Ensemble, doing what they do best – good music. The 3rd one is simply a delightfully different and lightweight bit of violin virtuosity at a club in California, featuring my current Love Interest Lili Haydn. Her work on “Mantra”, playing with Bill Laswell first showed me this incredible Canadian talent’s abilities as a musical prodigy – seen here in this link: http://www.youtube.com/watch?v=HF1jRKXEuJM. Here she does rock and roll in her own, um, “breathless fashion”. Quick, dirty and shameless, this ends up being partially autobiographical with the additional opportunity afforded by technology to share art with others. It’s pretty simple in the end. As a child of the 60’s, having grown up just as Rock and Roll emerged as the social force and general motivator that it did, my musical his-story is studded with some fairly predictable icons. I fully admit that and am delighted, the truth is, that I got to share the experience of this art with so many wonderful friends. The experience of art seems altogether useless at times without including the many shared experiences of appreciating my many wonderful soul mates who took the journey of these deepest forms of Love beside me, from my family to my friends. Naturally, I have a few of my very own unique aspects which I tend to view as eccentric enough to present as a sort of rating system with indulgent explanation which might or might not inspire others to continue reading and even to listen, all credit going to Youtube Technology as the greatest enabler of all. Around the age of 8, I learned to operate the family stereophonic record player which I found allowed me to choose my own music at those times I found myself alone enough, or included enough, to give it a whirl. The large tunes at that time – 1956 – ranged from Bill Haley and the Comets to the birth of that amazing phenomenon of Elvis. To say my sister thought a lot of Elvis would be a gross understatement. Which is another factor in my exposure to all music – I had older siblings. Yes, Sibelius. Later, I moved on, quite farther afield. At the ripe old age of 14, I discovered Bo Diddly. This was not as great a departure as one might think, because I and millions of others have always thought Bo Diddly was one hell of a musician. Somehow, he affected me at the deepest levels, all equal parts hormonal, experimental and eager for life itself. I suspect I only sensed rather dwelt on his innovative playing – I just know I thrived on his sound and the simplicity of his spirit. A monstrously deep drink of all music during such heady times as the 60’s – when anything seemed possible – led to what I perceived as a bizarre “flattening out” of modern pop music, probably beginning with the death of Jimi Hendrix, a complete favorite of mine and an innovator whose death implied a redirection of rock and roll, at least to me. What it did to me was redirect my interest to an interest in almost strictly experimental music. Having relocated to Vancouver, I found myself in basement Jazz Clubs watching Jazz guys like Ornette Coleman, over at LeChat Noir with Gavin Walker and searching for the “still-newer” music. It became rather rewarding in spades as I nearly completely turned my back on rock and roll and pop and thence found my interest exploding with an entire field of experimentation and novel artists. Sonny Sharrock, Weather Report, the Mahavishnu Orchestra, Miles Davis with the electric and controversial fusion creations. blending wild rock and roll principles with Jazz in a movement back toward bass beats, syncopation and outright psychedelic inspiration. So my musical search for the fresh and new wild caught many successful experiences which rewarded me greatly. I had the wonderful experience of attempting madly to stay on my generation – and even others’ – “cutting edge”. I led myself to believe I actually encountered the monstrous entirety of music – and then found how wildly small my thinking was as I more fully discovered the entire International realm of stuff. No, I hardly got lost – I got inspired. World music combinations led to an even greater mystery and even more hilarious adventures, bringing me to this very day. I can’t wait now until we hear from the Planets! Time for my standard break into music – the one Universal language, aside from the beauty we behold with our eyes and other senses (are you listening Gardenia’s?) – and which, as a child of the 60’s, I most believe will bring our poor dispirited and disparate lives together at some future point – in spite of the lack of imagination we behold in our leaders, all. My fondest hopes are quite often that we will award The Feminine a prominent seat at all of our spiritually- hungry tables, so ravenous we seem for beauty of form and intention in all of our lives and so reliable and unconditional the essential female willingness to love and nurture all under The Sun. In that light, I decided to borrow the Anima from all of the God and Goddesses – and feature some of my most soul-enriching experiences in the realm of the tuneful females who I most appreciate and whose music has historically most moved me. Inasmuch as this is just a slice of them all – because many who will go unnamed have motivated my life and work – please bear with a very selfish exercise in making up a little listening program which may please me and no one else. Taste is individual and merely somewhat of a defining trait of any personality. The fact that my omissions might speak louder than my inclusions is always the chance one takes when confessing. I absolutely adore the Celtic interest in Semitic pieces like this and their adaptations. Ms. McKinnitt is a true mistress Boss at this. Plus, her band is so brilliant they literally wash a soul. Her lilting vocal style is simply fresh and wonderful, treating this catchy, energetic tune in the spirit of the Police’s “Doo-Doo-Doo, Dah-Dah-Dah”. Ofra Haza. Her life cut tragically short by HIV contracted from her husband, Ofra’s gifts were taken away from us unfairly and way too early. Uncommonly beautiful with one of the most amazing voices it has been my good fortune to ever listen to, this Yemeni Jewish lady brought popularity to a wide number of deserving cultures, from Yemen to Tel Aviv and Israel. Approachable, affable and humble, she encountered bizarre marketing capitalizing on her beauty into a Disco-esque local queen for a while. But she was always an artist inside and she later was able to prove how deeply she felt towards social issues in her uncompromising art. The video below is a splendid example of someone who looked at the world and described it, warts and all. Ofra Haza is a true heroine of mine. I felt so delighted to encounter her when I did and I have saved that discovery to this very day in time. Here she performs at the Montreux Jazz Festival in 1990. I feel this displays the vocal qualities I rave about – and her beauty – of soul and physically. Betraying my Kentucky roots shamelessly, I don’t really care, lol. Emmylou Harris is a heartthrob of mine and I’m sticking with that story. While I had always really liked her work, when she put out the CD “Wrecking Ball”, combining with Daniel Lanois, it put her over the top in my estimation. But here I stray………I’ll post this one just for fun. Her twangy thing makes me wiggle. Joan Baez was another heart throb……I have rarely heard a more delicate rendering of a Dylan classic made more famous yet by The Band – or anyone for that matter – this is given this poem………..